Day four: travel day. The interesting thing about travel within India is the concept if time and its elasticity. Within each city, travel time is usually accurate. Rickshaw and taxi drivers will do anything in their power to get you to your destination in the time they have estimated. Since there seem to be no traffic laws, this typically isn’t a problem. Keeping their promises means a probable return trip and thus more money. Travel from town to town is quite a different story. It is customary to add at least 20-50% of the actual time given for an accurate guess at how long it will actually take you to arrive. The reasons for this are varied and unimportant. Today we are maneuvering around pot-holes, dodging cows and stopping for chai. You just don’t know. The gift for the curious tourist in traveling from town to town, or even within a city for that matter, is the richness of humanity. Today we have passed through towns defined by trash. As Americans we notice such things, possibly to our own detriment. We get stuck, we don’t understand. How could they live like this? By the time this thought process has wandered through and caught hold, you have missed the smiles of a people that see the beauty among and beyond the trash. You have missed the brightly decorated truck hauling bamboo with a dashboard filled with deities, coins and fresh flower garlands. You’ve failed to notice the painted horns of the sacred cows, the sleeping dogs, and barefoot children waving as they run to see you, the beautiful foreigner, in their small, best town in India. We have driven bumpally along through farming towns where cows with apparent excellent karma are free to graze green grass instead of picking through trash in town. Goats wander aimlessly until a frail looking herder nears with his staff. Red faced monkeys perch in the trees. Rows and rows of verdant green leafy vegetables sit adjacent to tiny ornate marble temples and sometimes graveyards with just a few remaining crooked markers. As the cities, towns and villages pass, we the beautiful foreigners, begin to look beyond the unfinished and unpainted buildings, the hastily thatched huts and, yes, the trash. We begin to point out the baby cows and the cat gingerly making its way across a corrugated metal roof. There are the children playing in the paddies, the man sleeping in the hammock, the bamboo scaffolding. Colorful laundry strung between tall palm trees, on a bright green lawn kept short by cows and goats. Ox driven hay carts with the driver sitting high atop the hay itself. And the trash. It’s all India. As we arrive at our first stop, we are dropped off on a narrow dirt street lined with houses that have been converted into an Ayurveda clinic, a temple and a restaurant, our destination. As we wander up the uneven stairs to the third floor restaurant we are greeted by rows of prayer flags waving in the open air. Chairs constructed of bamboo with stuffed cushions sit low to the floor. Each one is filled with people that look an awful lot like us. We have come upon the western hippie hang out. There’s a flash when one of us mutters, “there’s too many westerners here” that I want to agree with them. Then it occurs to me that we are that of which we would like to see less. Our presence and theirs, however, does not diminish the authenticity of this town. It’s a place of pilgrimage. Americans and Europeans alike walk around contained in a bliss cloud I have known and recognize. A short distance down this narrow street we find the ashram, dodging motorbikes and in one case a coconut that is thrown on the street with such force it shatters, along the way. Mistaking this gesture for anger, I realize once he pours oil and spice near the coconut and lights little fires, that this is an offering, a house blessing. The ashram is beautiful, serene and the air is full of chants and bells. 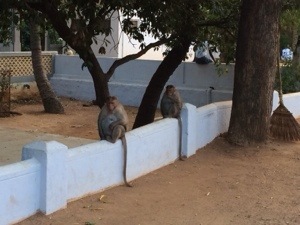 There are baby monkeys chasing each other from tree to tree while the adults sit still on the wall waiting for the food to come to them. Peacocks wander from place to place picking up whatever the monkeys have left behind. We meditate briefly in a small hall and as we begin to let go of our minds, the gentle chants from the hall next door guide us to that still space within us.